The best way to celebrate the Kentucky Derby is with a mint julep in one hand and Derby Pie Brownies in the other. Chocolate Brownies covered in bourbon, toasted pecans, and chocolate chips! Grab your hat, your Mint Julep, and these Derby Pie Brownies. The Kentucky Derby is coming up soon and you need to get ready to celebrate! At the Kentucky Derby, everyone is drinking bourbon, eating Derby Pie, and cheering on their favorite horse! 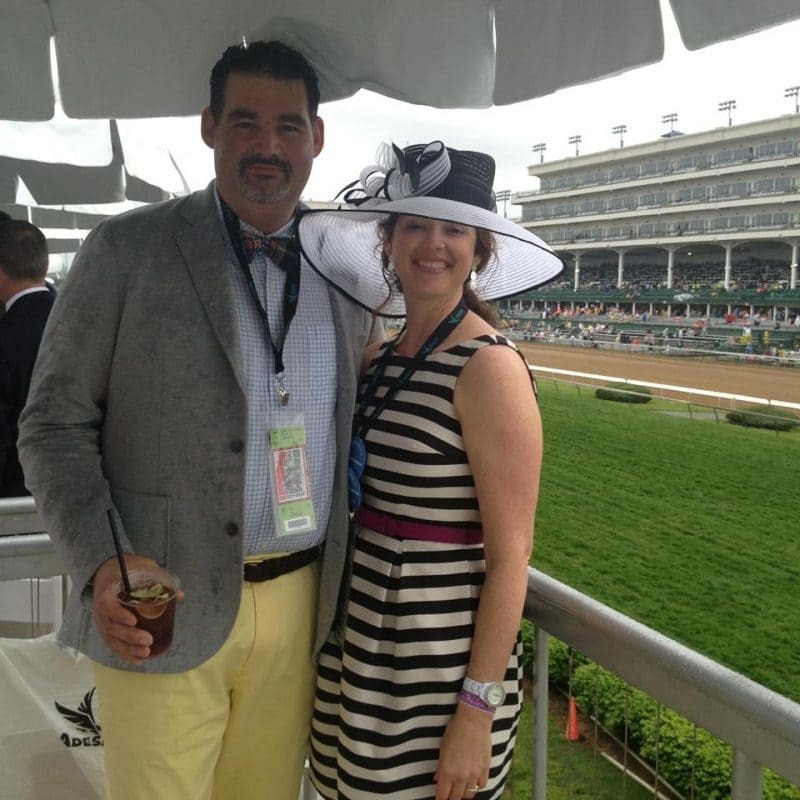 I had the privilege to go to the Kentucky Derby in 2013 and it was such an amazing experience. Here we are at Churchill Downs! I had such a great time walking around looking at hats, celebrity stalking when I saw one come in, drinking Oaks Lilies (the drink of the Oaks on Friday), and feeling the horses shake the ground when they raced by. I am still not a huge fan of bourbon in my drinks, but I do love it in my food. The best example of this is the Derby Pie. 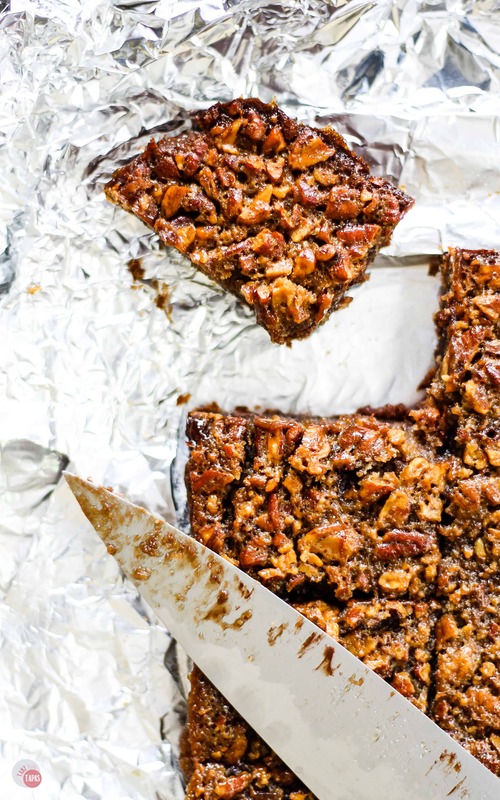 That classic combination of toasted pecans, chocolate chips, and bourbon filling a flaky pie crust. How about we take these classic flavors and add them to even more chocolate!!! The Kentucky Derby also makes me think of bourbon balls. I stick to the Oaks Lilies vodka drinks but bourbon reigns king and so do these Bourbon Balls that my hubby’s grandma used to make. I have seen quite a few variations on the Derby Pie while perusing Pinterest this week in anticipation of the Kentucky Derby and could only find smaller pies and cookie bars. This cookie bar recipe from Half Baked Harvest was my jumping off point. She inspired me to make a version that I hadn’t seen before. That delicious Derby Pie nestled on top of gooey, chocolatey brownies! Whip up a batch of these Derby Pie Brownies, grab your big outrageous hat, and head on over to your Kentucky Derby party! Don’t forget your Mint Julep too! Did anyone have any problem with the length of baking time? Mine stayed so gooey jiggly so I baked it for almost another 20 minutes and it stayed gooey in the middle and too hard to chew all around the outside. It had good flavor but I had to throw them away because they just weren’t right. 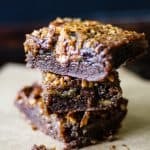 Would the recipe change if I used a box mix for the brownies? Do I cook the brownies completely before I put them back in the oven with the topping? Should I use one or two boxed mixes? You can definitely use a box mix for the brownie layer. I love the Duncan Hines dark chocolate fudge family size brand when I sub a box mix. Just make sure that you use a family size or you will have to use 2 boxes that are the 8×8 size. I would still cook them for the 25 minutes because you still need to cook them for another 35 minutes and if you cook them all the way they will be way too dry. Thanks for reading!! Made these last night for a derby party. I am not much of a baker and my kitchen is mostly packed up for a remodeling starting next week, so I used a boxed mix for the brownies. I also was in a rush so I probably should have let them cool more before the party. And I didn’t grease the pan enough so they stuck a bit. Despite all of this, they turned out amazing! They were still warm and gooey. The bourbon has just enough of a hint that the adults could taste it but the kids weren’t put off by it. My daughter has a peanut allergy so is sometimes suspicious of other nuts but she even came back for seconds. My husband and the others at the party are huge bourbon fans and they all raved about this dessert. I am definitely saving this recipe for the future. So much YUM in such a small brownie! Thank you for linking up to last weeks Creative K Kids’ Tasty Tuesday. Don’t forget to link up this week, if you haven’t already! These looks so good! 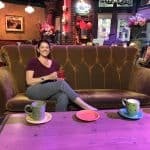 Sorry it took so long to visit – I’ve been off on vacation! Thanks for sharing on the What’s for Dinner link up! One of these days I’m finally going to make it to a horse race…it’s on my bucket list. Until then, I’ll settle for a few of these brownies! Happy Fiesta Friday! My favorite sporting event! What a great combination of two winning desserts. I’m adding this to “baking” list. The traditional derby pie is like a pecan pie but with chocolate and a little flour in it. Almost like a cookie pie. I love it with the brownies! Those are some phenomenal looking brownies! And since I love pecans, these are right up my alley! It certainly looks and sounds great. Lots of the girls at my school would go to the Kentucky Derby — they always came back raving about the experience. Now your pie looks like it would be an experience in itself. It truly is! I can’t get enough of them this time of year! How lovely this is, looks gooey and so yummy. Your outfit and that hat are so pretty you look so pretty and so elegant. I love derby events. Thank you so much! Checking out everyone else’s hats and dresses was almost as fun as watching the horses! There’s a derby themed event that my friend is having in a few weeks. These brownies would be just perfect. I hope they enjoy them! They are always a hit at my house! These look delicious. Such a fun spin on a brownie. I am sure the pretzels give the perfect amount of crunch. 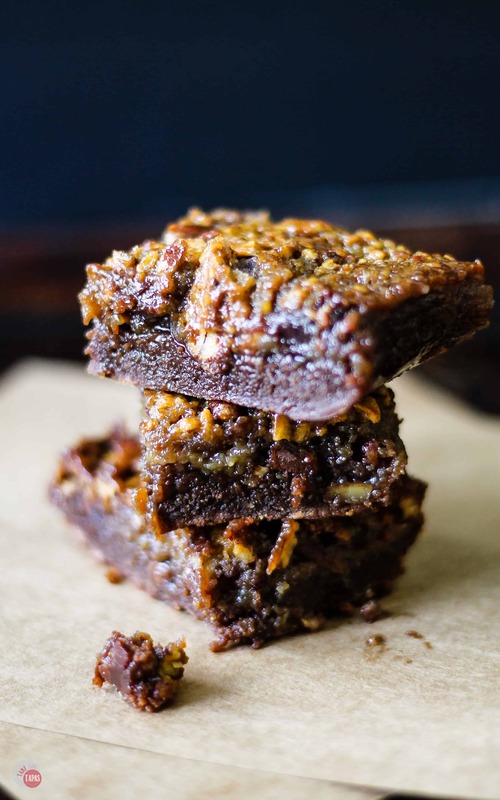 I love my brownies especially with some texture! These look so good. I love the topping. 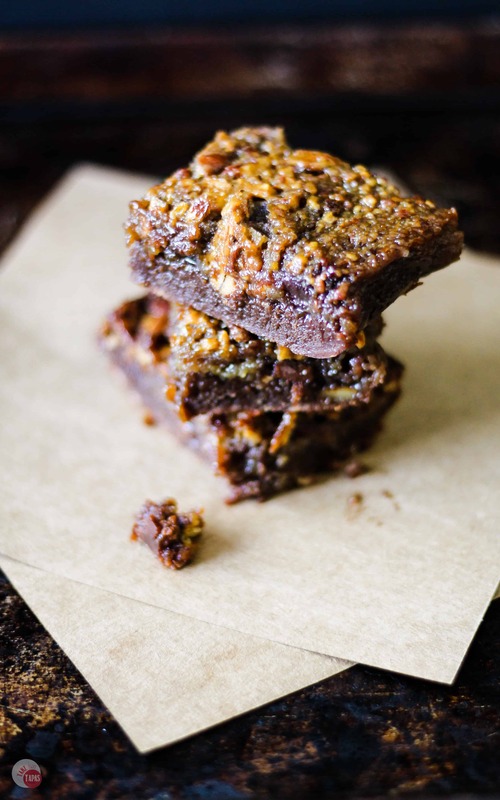 Pecans go so well with brownies..! Yum. Can’t wait to try these. These look Heavenly and I love your hat! W’re throwing a big Derby party this year and I think I’ll just have to make these! Thanks so much! I had such a great time and was so mad that it rained on my hat! Oh, that topping looks like pure heaven and both of you looked stunning on the Derby! Looks so yummy. Thanks for sharing at the Inspiration Spotlight party. Pinned & shared. See you again soon. Looking forward to trying these! Pinning. Visiting from Create It Thursday. I’ve been hearing a lot about Derby Pie and these bars look pretty darned special! I might have to have hat to eat them! Thanks for linking up with us at Throwback Thursday! No hat needed. Just an appetite:) Thanks for a great party! These brownies look AMAZING !! I am hoping to go to the Masters next! It was an adventure! Derby or not, I want these brownies ASAP! They look so absolutely scrumptious! Wow, these look so decadent and indulgent! Will have to make these for a potluck at some point, as they definitely will need to be shared. Thanks for the inspiration. Found you at Show and Tell party. Thank you for checking me out! Love that party! Inhaling before the kids see them! 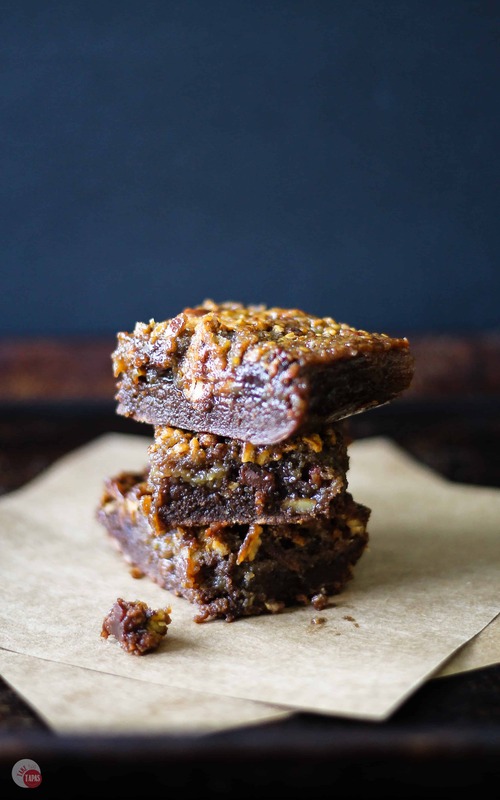 you had me at brownie – you can top a brownie with almost anything (well…) and I’d love it! these sound perfect for Derby or ANY day! Ha! Ha! I am with you–bourbon in food is so much better than bourbon in drinks! Love these brownies! Let’s hear it for eating our cocktails! Pecans are wonderful! Amazing recipe! Thanks Citra! I loved that hat too. I felt so regal wearing it. Going to the Derby looks like so much fun. One day I would love to do it. Turing Derby pie into brownies is another great idea. What a fun way to change it up.